Born in Aomori prefecture. Began self-study of oil painting and in 1920 organized Seikokai (Blue Light Group) to hold exhibitions twice a year. First went to Tokyo in 1924. Inspired to make moku-hanga by seeing a Kawakami Sumio print in 1926. Studied briefly with Hiratsuka Un’ichi in 1928. 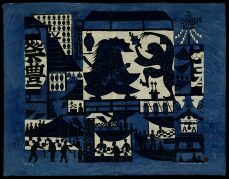 Exhibited prints with Kokugakai from 1930; member 1932-1953. Member of Nihon Hanga Kyokai 1932-1938. Exhibited early paintings at Hakujitsukai, Bunten, and Teiten. Met Yanagi Soetsu in 1936; from that time was strongly supported by Yanagi, Kawai Kanjiro, and Hamada Shoji of the folk art movement. From 1937 dealt frequently with Buddhist subjects. Contributed to Shiro to kuro, Han geijutsu, Kitsutsuki, Chokokuto, Hosun hanga, and Han. At the peak of Tokyo bombing in 1945 he evacuated to Toyama prefecture. Founded the hanga artist society Nihon Hanga-in (Banga-in) in 1952. First prizes at Lugano in 1952, Sao Paulo in 1955, and Venice in 1956. 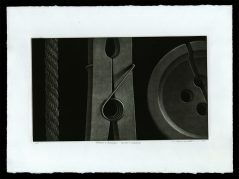 His spontaneously carved black and white prints became well known and widely honored. In 1959-1960 visited U.S. and held solo exhibitions in various cities. In 1961 granted the rank of Hokkyo by Horinji Temple, Kyoto, and in 1962 the rank of Hogen by Nisseki Temple in Toyama prefecture. Received Medal of Honor in 1963, Asahi shinbun culture prize in 1965, and Order of Cultural Merit in 1970. ** Taken in whole, or in part, with permission from: Merritt, Helen and Nanako Yamada. Guide to Modern Japanese Woodblock Prints: 1900-1975. University of Hawaii Press: Honolulu. 1992.